Here's your chance to have your very own Iron Golem roaming and guarding your house or bedroom, create your own Minecraft printable papercraft Iron Golem, cut out and build. 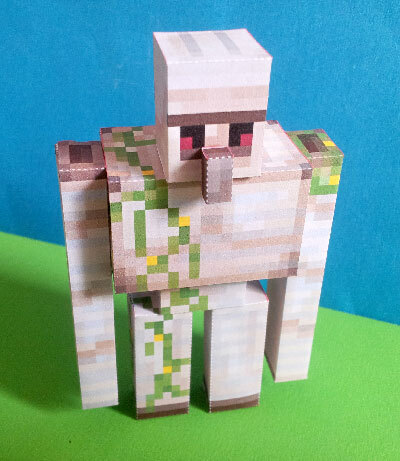 Right click and save image as, print out the Minecraft Iron Golem template, its a good idea to use card but you don't have to, it will still work with normal printer paper. Carefully cut out the separate body parts. DO NOT cut off the tabs on the sides of Iron Golem body parts, they are important! 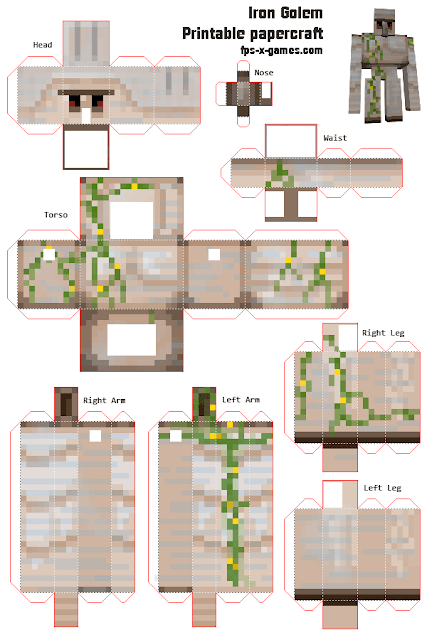 Fold all corners of your Minecraft Iron Golem cut-out mob template, tabs should always be folded inwards. Glue your Minecraft Iron Golem mob character cut-out templates together using the tabs! It's pretty good, I was just wondering if you could make a large-scale one because it turns out pretty small. If you already have then sorry!